North Union’s Journey Blevins blasts a hit over the net as an Indian Laker blocker attempts to get her hands on the shot. Blevins tallied 24 kills during the Lady Cats’ 3-0 sweep of the Lakers to remain in a tie for first place in the Central Buckeye Conference. 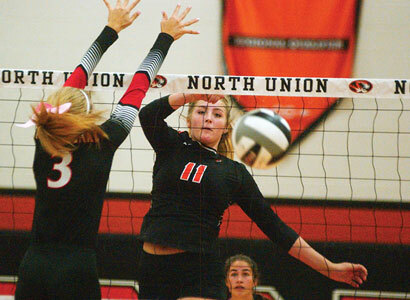 North Union’s volleyball squad took another step closer toward a Central Buckeye Conference championship on Tuesday. NU remains tied at the top of the standings with Benjamin Logan after a 3-0 victory over Indian Lake. The Lady Cats started set one with winning on their minds. They showed that winning spirit with strong net play from Journey Blevins, Lissie Michael, Kaitlin O’Conners and Grace Brandt. The quartet was able to keep the Lady Lakers at bay with solid blocking while crushing the ball over the net. The front line was aided by setter Josie Duncan to take a set one win by the score of 25-9. “One of the great strengths of our team is that we have multiple different hitters,” said Curts. “We are not relying on just one hitter to carry the whole team. Indian Lake kept pace with NU in the first few points of the second game. O’Conners, though, put several good serves over the net for a 7-4 NU lead. That margin quickly jumped to 20-10 as Michael began showcasing the power that eventually led to 18 kills. Brandt came up with a big block that helped win the set, 25-10. The Lady Cats maintained their consistency in set three as they jumped out to an early 13-2 lead on Blevins’ front-line play. She tipped, blasted and hit the ball over the net with enough success for 24 kills. That success continued throughout the match for the Lady Cats as they kept the score climbing in their directions. Brandt came through again with a solid block for the final set point and a 25-8 triumph. She also have five blocks in the match. “That (consistent play) is what the girls are focused on right now, especially over the last few games,” said Curts. “The fact is that we play really well for the first and second set and then we kind of relax. The win puts the Lady Cats (8-1) in a tie for first place in the Mad River Division of the CBC with Benjamin Logan, also 8-1. The Raiders moved past Graham 3-1 on Tuesday to collect their eighth victory. NU and Ben Logan each have a game remaining in the CBC with the Lady Cats taking on Urbana and the Raiders playing Indian Lake on Thursday at 7 p.m.
North Union also received their seed for the post season on Sunday where they landed in ninth. They will host the 15th seeded East Knox Tuesday at 6 p.m.
Curts said she doesn’t know much about the Lady Bulldogs, but is doing her homework. Even with the limited knowledge, Curts believes her Lady Cats are ready for any challenge.